Having my cousin around at the moment is so exciting. The fact that the last time I saw her, she was still a toddler in her diapers and today she has blossomed into a beautiful and sophisticated 25 year old young lady, would probably surprise you. But it’s true! The last time I visited India was roughly 20 years ago. That in itself is astonishing considering it is my birthplace and some of my dearest family live there. Being a Gemini as well, my cousin S. mirrors so many of my own traits and I see myself in her when I was 25. As she sits across me and we chat about the 1001 things, sipping cocktails, I am taken in by her refreshing and enthusiastic outlook on life. Currently she is in Milan, studying and training to be a superlative designer with her own label one day. Wait – she’s not any designer designing with fabric. No, she designs handbags. I know all my shoe and handbag crazy readers have just turned green with envy, but yes I am so proud of her. The memories I have are of her, in diapers, running through the corridors of my aunt’s house in Bombay. She would squeal with delight as I would throw her on the bed and tickle her until both of us had to stop for air from laughing so hard. Now, we are getting to know each other like two good girlfriends who have not seen each other for a few years. We talk about what we’ve done, how we’ve gotten here, what our dreams are and what moves us. We giggle about old boyfriends and lament about the bad relationships. I see she too asks the ancient question women have been asking for centuries. What is it with men? We have a ball imitating other family members and laugh so hard at the Bollywood style drama and dialogue we have witnessed, coming to the agreement that we should write one of those over-dramatic Indian soaps, our mothers love to watch. Both of us are also reveling in each others creativity, inspiring each other with new ideas and thoughts. I have always found it exhilarating to be able to talk about design, writing and photography with akin soul mates and I really like her input on my photography portfolio. I also realized S. has an amazing appetite. Wonder where it goes because she is incredibly skinny! But I love it. She is open to all kinds of foods and does not shy away from experimenting with new flavors. This summery salad gets its inspiration from the traditional Arab fattoush. I’ve used quinoa as my grain of choice for the salad as it is perfectly light and delicate, fitting the season. Sweet, juicy and aromatic cherry tomatoes make this salad so try and get the best ones you can. I then slow roast the tomatoes in olive oil and some garlic, and then add them to the salad. The garlic marinated halloumi is a dream paired with the salad and adds a wonderful and bold new level to it, making it a magnificent whole meal. Preheat oven to 160 degrees C. In a mixing bowl, toss whole cherry tomatoes with 30ml olive oil and half of the crushed garlic. Sprinkle with some salt and spread out on a roasting tray. Roast for approx. 30 minutes or until they are tender but still hold their shape. In the meantime marinate the halloumi cheese in a mixture of 50ml olive oil and the remaining crushed garlic for 30 minutes. Cook the quinoa in a saucepan of boiling water for 8-10 minutes, or until tender (see instructions on the packet). Drain in a fine sieve and leave to dry. In a bowl, add the cucumbers, onions, herbs, quinoa, salt and pepper to taste. Make a dressing using the remaining 70ml olive oil, lemon juice, vinegar and zest. Pour over the cucumber and herbs. Toss well, then add the roasted tomatoes and gently fold into the mixture. Taste and adjust seasoning. Set aside for flavors to incorporate. In the meantime pan-fry the halloumi cheese in a non-stick pan until golden on both sides. Better still, grill the cheese slices on a charcoal barbecue. Drain on some paper kitchen towels. Serve immediately. Serve the quinoa salad with slices of the garlic halloumi and sides of minty hummus or tahini yogurt sauce. I simply adore salads like this because they include a mixture of striking flavors and wonderful ingredients. Quinoa is lighter than most grains and it’s texture and flavor pairs well with the aromatic slow roasted tomatoes. The halloumi is addictive with the garlic flavors adding a powerful punch. The halloumi should be made fresh and enjoyed when it’s hot, as it tends to get rather rubbery when it is cold. However, you can make double portions of the salad as it tastes better the next day. Enjoy! This sounds delicious! Have a great time with your cousin. Sounds right up my alley, I absolutely love haloumi! Looks fantastic! Simple and amazing...cant wait to see what you make for yr boy! I love Salads and this sounds too delicious. Have a lovely time with your cousin. Refreshing. You know, when yuo come back from holidays you go searching for small things that will lead you into your autumn daily life with softness, a sparkle of happiness and a warm sensation of well being. Once again I count your blog into my personal list of those things, it's so pleasureful to read it, sharing with you feelings and emotions! Lucky you! I miss those girlie chit chats with my cousins so much! lol on the diaper days. Wishing her good luck with her studies and hope you both have a great time together. What a gorgeous salad combination, very nice idea. I love halloumi and that sounds marvelous! Ha, I bet your cousin's not too happy to be referred to as diaper-wearing in the bulk of this post :) Great to hear you're having a blast reconnecting with family! I'm all for hanging out with inspiring people - so you indulge! And maybe we'll find some handbag-shaped cake on this site one day - OR: some cake decorated handbag in the shops! Either way, pretty cool! 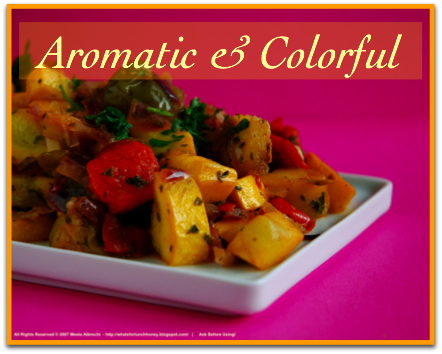 This salad looks so delightful with those beautiful colors! lovely light and hearty dish. It has been a long time since I have met any of my cousins. miss the times together and the girly things we did together. Enjoy Meeta! Family reunions are fun (most of the time! )...love the simple salad and of course I love the halloumi in this Meeta! Absolutely striking! This salad looks like my kind of summer dinner, especially with that wonderful garlicky cheese on top. You have an absolutely beautiful website! And that salad of yours looks so scrumptious :)! I remember when I got to know my baby cousins as bubbly, bright young adolescents, instead of the wee little girls who would follow my brother and I around the house shyly, asking to be tucked into bed and kissed goodnight; and willingly being slathered with make-up and dressed up like little dolls, proudly showing my handiwork to my uncle and aunt's bemused faces. It was a strange feeling for them to be suddenly so grown-up - I still call them my 'baby cousins', when one will be 21 next year and the other 20. Hardly babies anymore. There's surely nothing better than getting to know them as young adults, though, and giggling over things only family can. Well. Maybe only improved if food and drink is involved too, which it often is! Beautiful halloumi and quinoa salad - how wonderful that your cousin has inspired such deliciousness! This sounds exactly as it looks.. Delicious! One more delicious creation! Quinoa in salads is sooooo good! I like the little crunch of its grains! Wow,excellent salad.Grilled halloumi is excellent I have heard.Enjoy the time with your cousin. I love halloumi. Everytime when we heat up the grill outdoors, I need to have some halloumi. It's my fave just quickly fried on the pan too. The recipe looks so yummy. Garlic marinate sounds perfect for it! I also like to pair the cheese with strawberries and balsamic syrup. Excellent idea. I always eat my halloumi very simple. Grilled, with tomato and sliced cucumbers. Its just perfect but i am going to have to try it this way. The colours and flavours are literlly jumping out at you!!!! Enjoy the visit with your cousin! How lovely to get to know her as a young woman. Salad looks delish! Could do with a bowl of that for lunch, that's for sure. I love every aspect of this dish!!! By the way, I just posted about your lamb meatballs with spelt risotto and omg it was the most amazing dish ever!! Thank you! Looks fantastic! Love Halloumi! Enjoy your visit with your cousin! you wont believe I was looking for a recipe with Halloumi and a seperate Quinoa recipe cos Im tired of making my quinoa the same way everytime. Do you read minds too ? YUM! So healthful and appetizing! Beautiful snaps! Mmmm, I LOVE halloumi - can we please have this with our cocktails next time I visit? Or maybe in London in November... :o) S is a HANDBAG designer?! OMG! So if you and I are sisters, surely the cousin of my sister is my cousin too and family discount for gorgeous handbags extends to me too? ;-) Miss you, chica! What fun! And I'd love to see her work one day - you know I did my millinery training in Milan and know people in the handbag business! Very cool! And fabulous end-of-summer salad, Meeta! What a tasty way to enjoy some halloumi cheese! i never thought to marinate haloumi. this looks delicious! Lucky lucky you to have a handbag designer as a cousin! But she is lucky as well to have a cousin like you to cook for her :) Lovely salad! What a gorgeous meet up Meeta... I can see the too of you right from the diaper stage to now, giggling uncontrollably! I love the way your post flowed; beautifully written & fun, somewhat like this gorgeous salad. The halloumi with garlic is calling my name! I love haloumi but never had quinoa before. It's about time I tried it, I see all over the place! I just made this for lunch today and it is fabulous! I love quinoa and haloumi cheese so I knew that I needed to try it as soon as I saw it! Thank you for such an awesome recipe! Thanks everyone for all your lovely comments. Glad you all are liking this. Having my cousin around is not only a lot of fun but extremely inspiring. I admit I am tired as hell due to the late nights but happy!! Sorry, the page you were looking for in the blog What's For Lunch Honey? | Experience Your Senses does not exist. maybe there is a problem with my server?